A small town girl from Nova Scotia, now living in the big city of Toronto. If your lucky, at least once in your life a pet touches your heart in ways that are hard to find words for. That happened to me with Buster. I adopted her from the Toronto Humane Society on July 13th, 1991 and my life was forever changed. She was the first pet that I was solely responsible for and I took that responsibility very seriously. She wasn't very friendly to others, but she loved me, and I her. On March 25th, 2005 I had to let her go due to stomach cancer. It was one of the hardest things I ever had to do. I held her to my chest when she took her final breath and felt her last heart beat. My mother asked me how could I do that? How could I not? I had been her whole life for 14 years and I wasn't going to let her last minutes be with strangers. She'd been there for me through hard times and heart break, I was going to be there for her during this. My heart still aches for her loss, but I'm also very grateful for the 14 wonderful years she gave me and appreciate our special bond. I cherish the memories I made with my little buddy, Buster. 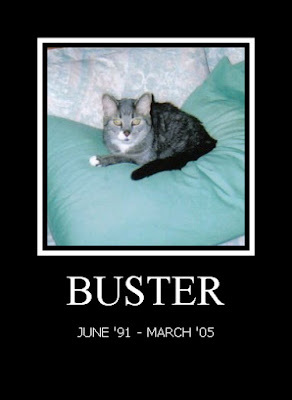 I did not have the pleasure or honor of getting to know Buster. I know exactly what you mean. I'm sorry for your loss. RB died a year ago this month and his anniversary was rough on me too. It's hard when we have to say good-bye ... but they are always with us. Hey Angie,I know exactly what you mean by loosing the first real pet that you ever had.I had to put my Murphy Leigh (cat) down six years ago this past Feb.18.She died exactly one day past her 10th birthday.I was with her as she drew her last breath,I will miss her forever and look forward to seeing her again someday when my time comes. Until then I have a handsome little boy named Coalie who is now the love of my life,he was born in Upper Economy the end of May/06.He is truly the most lovable cat I have ever owned.He gives kisses on the lips and wakes me up by jumping on me in the mornings.One day i didnt get up when he wanted me to so he grabbed a fairly large hunk of my hair and pulled hard and fast.Boy that sure got me up and going real fast.So I know what you mean when you say they are part of you.I dont know what i would ever do without a cat in my life. As you know I am feeling just like you. Its unbearable when you lose such a good friend. Sometimes I think i see Haydn out the corner of my eye. I'm so sorry. She was beautiful. Beautiful post, Angie. My thoughts are of you and Buster today. My thoughts are with you. It's not easy letting go someone you love so dearly, especially a pet. My cat, Spade, passed away almost 4 years ago this summer. He was the love of my life, and like you, the first pet I ever had sole responsibility for. I miss his conversations with me, and our morning routines the most. Sometimes I see a black cat, and I think it's him. But I know he's in a better place and at some point, I'll see him again. We now have a little cat, Carma. She came shortly after Spade passed away. She needed someone to love her unconditionally as she was a very timid, scared feral cat. When she looks at me with such contentment and love, I know now Spade moved on at the right time. Carma will never take place of Spade in my heart, but she now has a room beside him there. Our other cat, Sparkles, is a 16 year old marmalade tabby. We're having the hard time knowing what to do. She's lost a lot of weight and is constantly confused. She has her good days and her bad. Since she's been on the farm since birth, we want her last remaining days to be here. We don't know how long that will be. It's hard to see her sometimes, especially with her arthritis. My heart goes out to you, Angie. I know you loved Buster very much. He loved you just as much. He's in a better place & today you can celebrate all the fond memories that you had together. Lots of love & hugs today. My blog is a place for me to share my love of nature and birds, tell you about fun nights out with friends and share my thoughts on a variety of topics. Happily married for six years but together for fifteen. I lead an active social life, and have an amazing circle of girlfriends. Rob and I spend a lot of our free time on birding and nature trips, it's our favorite thing to do! I hope you enjoy this little glimpse into my life. Thanks for stopping by and please visit again soon. PS: Rob takes most of the bird/nature shots, he wanted me to tell you that. 1. Click on the photos to enlarge them. 2. Any coloured words in the blog posts are direct links to whatever it is I'm writing about. Bird Life List Now at 299 Species. Me & My Hubby, aka Rob. Never Miss a Post! Follow by E-Mail! It must be spring, the butterflies are back. Lots of makes and only one failure.